COPPER MOUNTAIN, Colo. – Jan. 4, 2018 -- Mark your calendars for the largest and most fun safety event of the season. 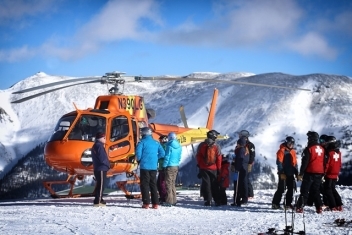 As part of the National Ski Area Association’s (NSAA) Safety Awareness Month, Copper Mountain’s annual Safety Fest returns on Jan. 13-14 inviting visitors, locals and employees to a weekend of education, yoga, prizes and more. From Saturday, Jan. 13 to Sunday, Jan. 14, Burning Stones Plaza in Copper’s Center Village will transform into Safety Village with Woodward Copper, US Forest Service, Nokian Tyres, and many more partners on hand to provide information about progression, backcountry awareness and Copper’s safety initiatives. New this year is a free community yoga class from 9-10 a.m. in the Copper Conference Center each morning. On Jan. 13, a free screening of High Fives Foundation’s BASICS film with an athlete signing will kick off at 6 p.m in the Woodward Copper Barn. The powerful snow safety documentary addresses the critical vulnerabilities an athlete inevitably encounters while enjoying time in the mountains. Flight for Life helicopter tour: At 10 a.m. on Saturday, meet the pilot and medics at the top of the Excelerator lift outside Patrol Headquarters and get a tour of Copper’s air-transport helicopter. Copper Avalanche Dogs in action: On Saturday and Sunday, watch Fido search and find a buried avalanche victim. Takes place at 11 a.m. in Center Village and 12:30 p.m. in West Village. Close the mountain with Ski Patrol: Ever wonder how ski patrol “sweeps” and closes the mountain? Sign up at the Junior Ski Patrol booth and spend the late afternoon clearing the slopes with the professionals. Daily raffle prize giveaways: Guests who visit each safety tent will be entered into a daily prize drawing at 3 p.m. in Burning Stones Plaza. Top prizes include 2 nights lodging, season pass, parking passes, tubing, ski tunes, helmets, restaurant gift cards and more. For a full schedule of activities and events as part of Safety Fest, visit coppercolorado.com. MEDIA NOTE: Broadcast quality photos and broll can be found here.